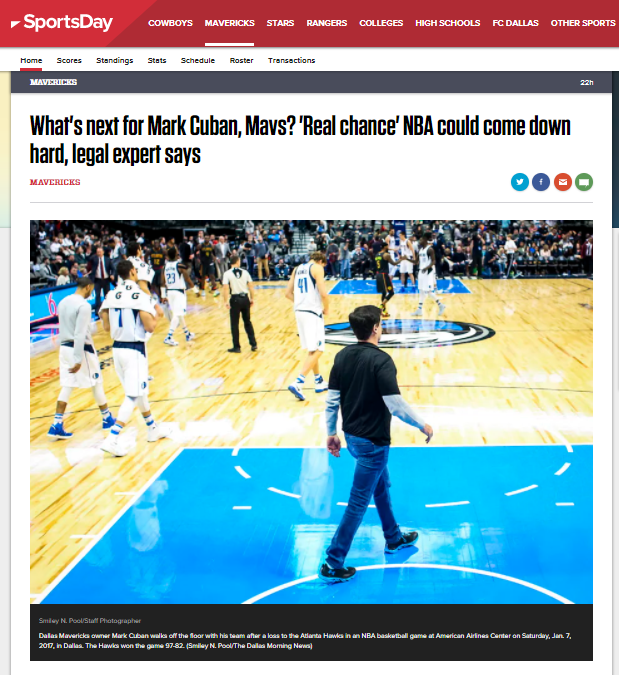 LOS ANGELES — So, what is next for Mark Cuban and the Mavericks? We know there will be a lengthy investigation by the people hired to find out exactly what’s what in the sexual misconduct scandal that has rocked the franchise. We know there will be repercussions — but to what extent? Maybe the best parallel to the Mavericks’ case involved the New York Knicks in 2007 when Isiah Thomas was the team’s coach and president of basketball operations. A female employee complained of a hostile workplace environment that included sexual harassment by Thomas. The employee said she later was fired for filing her complaint. It’s far too early to know what financial penalty is headed toward Cuban and the Mavericks, but that might be getting off light — if their prized draft pick survives. Dunn, who has worked in numerous high-profile sports-related cases — including representing Texas Tech’s president against former football coach Mike Leach — said the possibility of civil suits is unlikely but not impossible. “In terms of legal claims, most of them are time-barred,” Dunn said of lawsuits from individuals. “However, even if they have gotten rid of the main harasser, there could be legal risk if that sort of culture still runs deep. What remains unanswered, but certainly will come out in the investigation, is just how much Cuban knew — and when — about the 1998 internal investigation into complaints against Ussery. What investigators and the Mavericks know for sure is that, on Thursday, a memo was sent out to all 30 teams by Commissioner Adam Silver that said there would be a confidential hotline in place to report workplace misconduct. It is part of the league’s “Respect in the Workplace” initiative, ESPN reported.